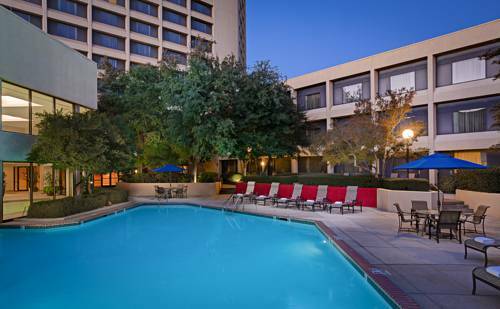 Touch down for a rewarding stay at Dallas/Fort Worth Airport Marriott, featuring elegant event and public spaces. Located next door to DFW International Airport, we provide complimentary shuttle service to and from the transportation hub for your convenience. Between meetings and adventures, find refreshing places to wind down on-site. Grab a Starbucks drink in the lobby, enjoy dinner and drinks at our signature restaurant, or go for a swim in our indoor or outdoor pool. Active travelers can also enjoy a workout in our modern fitness center with state-of-the-art cardio equipment and free weights. As the day draws to a close, retire to Texas-sized guest rooms and suites, or host a gathering in one of our DFW airport hotel's sophisticated event rooms, totaling over 20,000 square feet of space. For our Platinum Bonvoy Members and higher, enjoy our new M Club. Feel at home with Marriott's plush Revive bedding, ergonomic workspaces and high-speed internet. Make a reservation for a successful Dallas stay today! Urban Spur: Celebrating American fare with local flair, Urban Spur Grill & Bar at the DFW Airport Marriott provides a vibrant dining experience that stays true to its roots drawing on the diversity of Texas farm-rich regions and flavors to inspire. Ft. Worth's "Cowboys, Culture and Rodeo"